If you were to ask me, “What is the one item you would like to own for your home that you do not already have?”, the very first thing that would come to mind without a moment’s hesitation would be Pia Wallén’s Crux Blanket. Prohibitively expensive (5,500 SEK is about $770 US) but ridiculously beautiful, it has become an object of desire from afar for me. I regularly check the website to see what colors are in stock, and just to make sure the price hasn’t miraculously dropped by 75%. I’ve been obsessing over it for years. I even used it as a template for my medicine cabinet! Let’s fantasize together, shall we? 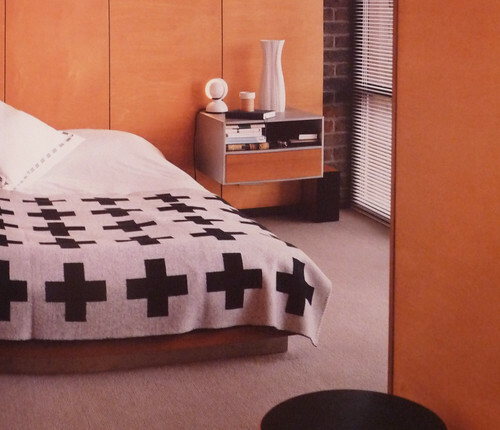 This photo marks the first place I ever spotted the Crux Blanket—in the bedroom of Michael Asplund, co-founder of the Swedish company Asplund. 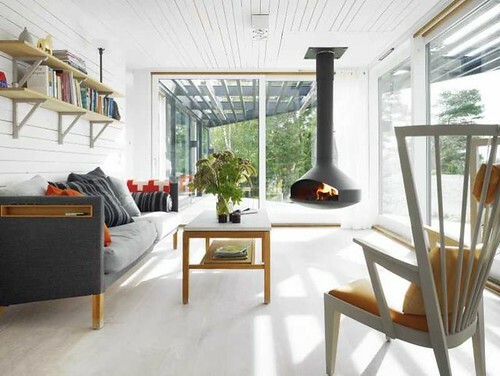 A tour of his home is featured in the wonderfully inspiring book Scandinavian Homes. 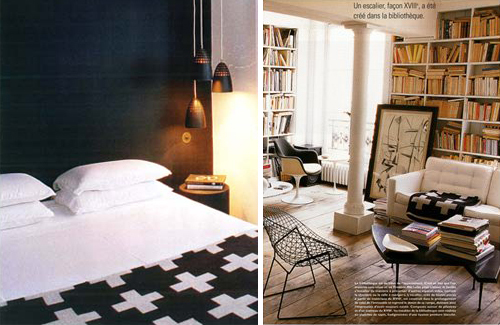 What makes Frédéric Méchiche’s loft even more perfect? 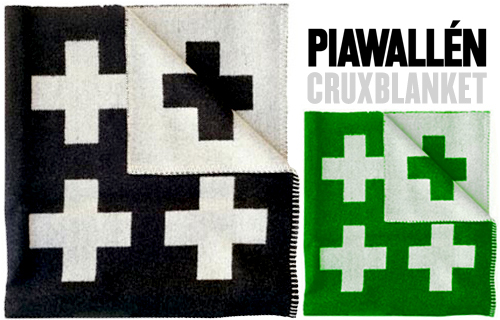 That’s right, a Pia Wallén Crux Blanket. See? 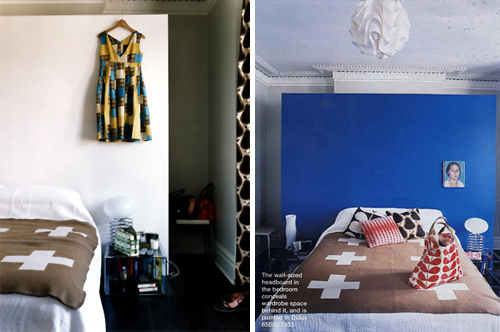 Orla Kiely has a Pia Wallén Crux Blanket in her house, too. I’ve been eyeing that blanket for years myself, but ironically I never actually knew who designed it. I’ve just seen it in many of the same pics that you posted above. Does anyone know of a cheaper lookalike? $770 for a blanket is pretty crazy to think about. But it IS lovely. I agree and sympathize. It is so perfect, but totally crazy expensive. Another check on my list of things of things I admire from afar. Ha, you’re so right! I do want one now! But then, I’m a big blanket fan and there’s quite a lot that tempt me. Thank you! I just cleaned my head of all the things I wanted. But now I want this one!! It is time to open my Etsy account and sell! if you did find that the price had miraculously dropped by 75%, what color would you get the blanket in? Hypothetically and let’s pretend, where would you put it? $700+ is a lot for a blanket, i’d be hard pressed to justify that expense have you thought about making something similar but giving it your individual ‘stamp’, you’ve done such wonderful diy on your home why not a ‘version’ of this too? Hmmm…that FLICKR picture makes me think you could make/have made a quilt in this pattern. Or do some block printing on an existing blanket. Maybe even embroider the outline of the crux on a wool blanket and then felt them (I think I saw this recently in Martha Stewart). I realize this is not quite the same, but is a more attainable goal. Just a thought! 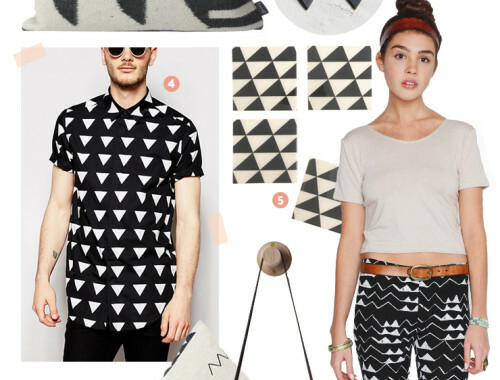 alke: Oh, I don’t need to think twice — black/offwhite, for sure. Jessica/elaine/lindsay/kristen_v: While I’m sure it’s possible to make a reasonable facsimile of nearly anything, there are certain things that I feel strongly enough about to only want the real thing. This is one of them. For me, it’s not just about the look of the object, but the craft involved in making it and the type and use of materials. Those factors, combined with the perfection of proportion and scale used in the creating the design, are all part of the process that the artist, Pia Wallén, employed when creating this blanket. I want to support that entire process (and own a piece of it), not just have the look of the blanket itself. If you could get it even a BIT on sale, it looks like something you would have and use for years and years. I’ll play devil’s advocate and say go for it Anna. What is $770? Heck you got a garbage can for $250. dee: Actually, it was $210, but regardless — spending what might seem like a relatively large amount of money for one thing does not cause $770 to magically materialize for another. You have to understand that the trash can was bought in the context of a ultra-tightly-budgeted bathroom renovation. For example, spending only $100 on wall tiles allowed to splurge in another area — in that case, the trash can. Everything we do in our house is done with that kind of budgeting in mind. Also, keep in mind that we’re now in our 4th year of renovations — we save to do each thing, and have to wait a while sometimes. It’s very difficult to justify spending that kind of money on a blanket — not because we have a fancy trash can in our bathroom, but because it’s not a prudent use of our income right now. Best post ever, maybe? I love reading about this particular strain of design-mania, a condition to which I’ve succumbed more than once. The fact that you spotted this blanket in that Skona Hem photo suggests you are beyond hope. Hang in there. It’s crazy how looking at something in the right context will drive you crazy with desire. I want it! So…we got the house! I wanted to let you know. I’ll be budgeting this blanket in to the living room renovation. 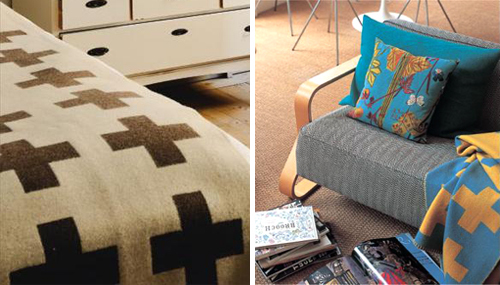 Are you familiar with Welsh Tapestry Blankets? Not as graphic as the Crux but maybe a distant cousin. They have a lovely pixilated quality. Vintage ones come up regularly on ebay.co.uk for £30-£100 sterling. Do you happen to know the link for the rest of the article in Skona Hem (from whence the picture came)? I love that room. I’d like to make it mine. Very much. So gorgeous. I’ll just have to comfort myself with my Pia Wallen slippers. 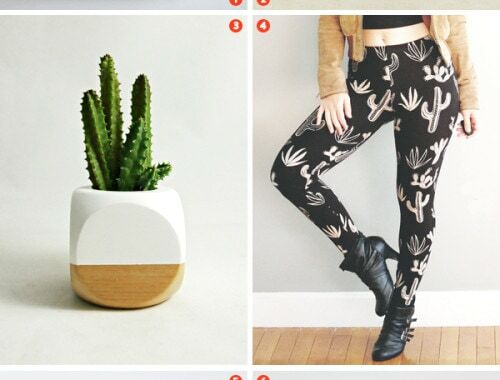 I just saw this in Etsy’s daily email. I know that someday it will be yours. I will will it to go on sale. I know the Crux blanket is pricey, but we had the pleasure of seeing it first hand and hearing about it’s process from Pia when we visited her studio (sourcing product for our store). The quality is exceptional, more perfect than any blanket I’ve ever touched – just soft enough, just thick enough, just warm enough. A Swedish family farm use their own sheep for wool and create the blankets right there in the same place. The process is so delicate, that if the weather isn’t right (humidity levels), it can stop production for months. Anyway, when we saw and touched these blankets, the cost was justified. You could buy cheap blanket after cheap blanket, but this is one that you’d enjoy for a very long time – and sometimes that is more important than cheap thrills (as fun as those can be too). I hope that helps you in taking the big step! Speaking of books, have you seen this one? It’s great. Just browsing through etsy newsletter and (sorry if you’ve already got this) I saw a little pillow inspired by these blankets at a slightly nicer price…. i want it in black + white! i guess i’ll keep coinstar’ing until i hit 770. Yes, (now) I want one too! Not that I could ever afford it – and even if I somehow could it wouldn’t look that nice for long, thanks to Lissu. I’ve seen that blanket around on the web and just figured I’d pick one up someday when I find out where to get one and when I need a new blanket. I had no idea it was so expensive! Ugghhh, now I’m in lust mode! I’d like to know just what it is that makes those simple crosses so appealing! Love these! Garnet Hill had a similar one a few years ago. I wanted to buy it then, but I kept waiting for it to go on sale and I don’t think it ever did — and I’ve been kicking myself for not buying it ever since. It was red with 1 medium/large white cross on it. It definitely wasn’t as pricey as these though! I’m sending vibes your way that you will get it one day! I love it too! 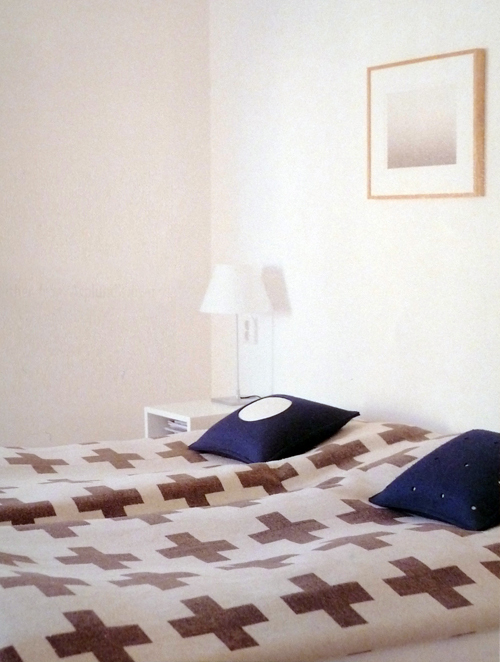 with you 100%, i love that blanket and Pia Wallén’s work in general! 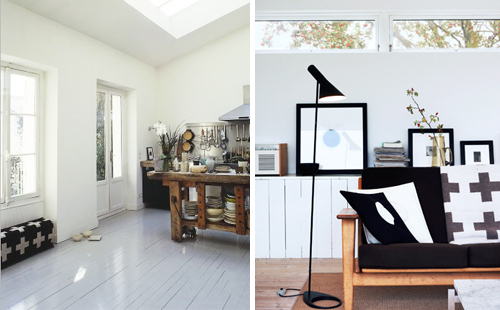 Simple yet elegant but it IS expensive especially when you are in the midst of renovating a home. Perhaps it is something you can treat yourself to at a later date…but your decor is just as gorgeous wthout it. It is a beautiful blanket. So ridiculously priced, though. That blanket is crazy cute. I’m in favor of making an approximation until I can afford such wild extravagances. (Wool blankets are available for next to nothing at thrift stores…) I think I’ll try making a version. Thanks for the inspiration / aspiration! I would get it in red! Love the colour pop. I am wondering if they have it at Scandanavia House? quite possibly the cutest picture i have EVER seen. I love it, the picture with the brown blanket with the blue backwall is exactly how I imagine my bedroom. I’ve been searching blankets since this post. I know it’s not the same and not in black and white but on manufactum.de sells swiss army blankets for a less extravagant price. I don’t know if anyone has mentioned this.. 47 comments proved too many for me to read- but this is a very simple pattern and could easily be converted into a quilt or a knit pattern. Knitting would take some time, but would be simple to do as the design would be in color and not stitch pattern. A Quilt could be done easily with two colors and matching thread. Oh and my god that image of a wood stove above a white carpet makes me cringe!! Imagine how stressful it would be to clean the soot out of that thing! The dirt on the carpet from the wood! Ahh! Oh my! That is quite a pricey blanket. I suppose the price makes it a “look at what I have” thing, not sure if you’d let your guests use it though. Gali: Of course I’d let my guests use it! Why not? I don’t have a feeling of preciousness about anything I own, and nothing in my home is intended to be a mark of status (or “look at what I have”). It makes no difference to me whether something was $2 at a thrift store, $20 at IKEA, or $770 from a high-end shop. What matters to me is whether something is designed well and made to last. This is more swiss army, but for under $20 and it’s wool, seems hard to beat. if that link doesn’t work google Swiss Reproduction Wool Blanket. These are beautiful! I can’t imagine paying $775 for it though, yikes! My bed didn’t even cost that much… but seriously– very cute. I bet they are so warm!